Last week, a research team at the Yale School of Medicine published data in Cell that appears to unveil some of the mystery behind autism. The scientists relied on induced pluripotent stem cells (iPS) derived from skin samples of people with severe forms of ASD. Rather than maturing the stem cells into a flat layer of brain cells, or neurons, on a plastic petri dish, the Yale team stirred the cells in a bioreactor. 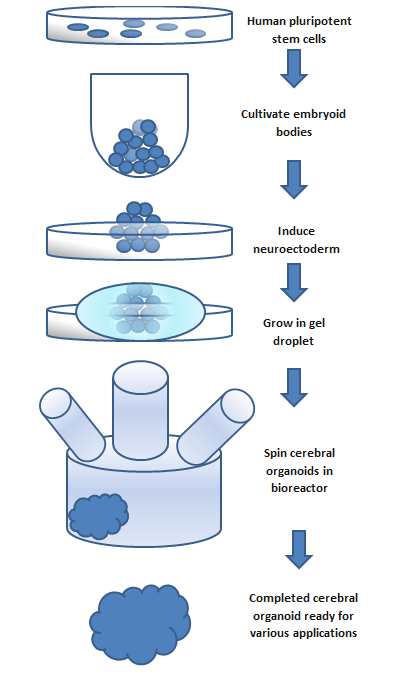 This technique allows the cells to mature in a small three-dimensional clump, which self organizes into so-called brain “organoids” or “mini-brains.” The structure of these mini-brains resembles the portions of the developing fetal human brain, the stage at which autism is thought to arise. An analysis of the mini-brains found no underlying genetic mutations. Instead, the team identified genes involved with cell growth and neuron development that were turned on higher in the ASD vs. non-ASD mini-brains. A closer look at cell growth showed that inhibitory neurons, responsible for keeping nerve signals in check, were increased in number in the ASD mini-brains. Teasing out this discovery further pinpointed a protein, called FOXG1, which was responsible for the increased cell growth of the inhibitory neurons. Here’s the interesting part if you’re still with me: of the four patient samples used in this study, higher levels of FOXG1 protein correlated with more severe ASD. And blocking the production of FOXG1 in the ASD mini-brains reduced the inhibitory neurons back to normal levels. Although this initial finding doesn’t directly link FOXG1 and autism, the results suggest a common disease mechanism: that autism may arise by over producing FOXG1 which in turn creates too many inhibitory neurons during brain development and somehow disrupts connections between neurons.